Look! It's a rare, collectible, plush squirrel! Do you even need me to tell you what game this an Amazon-exclusive pre-order goody for? No, of course you don't, not because it's obvious, but because you will buy ANYTHING to get your hands on a rare, collectible....did we mention collectible? A rare, collectible, plush squirrel. 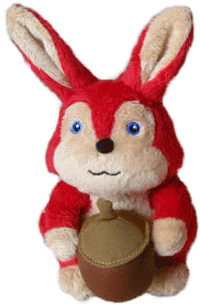 This isn't just some average, run-of-the-mill, mass-production plush squirrel. You don't give a squirrel like this to a baby and let it chew on it for hours. No. This is a vacuum-sealed in a glass case squirrel. *drools* Where was I? Oh yes! This is a pre-order bonus for Rune Factory 2: A Fantasy Harvest Moon for the Nintendo DS, and you can only get it at Amazon.com. You might want to set up your order now before this baby winds up on eBay's ridiculously inflated rare, collectible, plush squirrel aftermarket.NATSUME ANNOUNCES EXCLUSIVE PRE-ORDER GIFT WITH AMAZON.COM FOR RUNE FACTORY 2: A FANTASY HARVEST MOON FOR NINTENDO DS Order The Game Now And Receive A Rare, Collectible Plush Squirrel Burlingame, Calif., October 6, 2008 - Natsume Inc., a worldwide developer and publisher of family-oriented video games, announced today that it will offer an adorable squirrel plush as an exclusive pre-order gift for customers who order Rune Factory 2: A Fantasy Harvest Moon for Nintendo DS from Amazon.com. "There are gamers counting the days until they get their hands on Rune Factory 2, and we wanted to give them a little something special for being the first to order the game," said Hiro Maekawa, President and CEO at Natsume. "Fans of Rune Factory and Harvest Moon have loved the exclusive plushes that we have created for the series over the years, so we know that they will be excited to get their hands on this one and add it to their collection." Rune Factory 2 will be available for the Nintendo DS system in U.S. retail outlets later this fall. 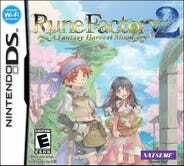 The Rune Factory series combines the fun and rewarding Harvest Moon gameplay that fans know and love with the fantasy and excitement of an action-RPG, offering Harvest Moon fans and traditional RPG players the best of both worlds. Rune Factory 2 is set several years after the first game. The evil Sechs Empire has been defeated, and the Kingdom of Norad is once again at peace. Things may not stay that way for long, however, as strange disturbances in the earth warn that a great evil is stirring. It's up to player to uncover this new threat to the land and bring peace to the kingdom once more. Over the course of the story, players will build and develop a farm, befriend townspeople, raise monsters, take on quests, and find a wife. In a first for the Rune Factory series, the story of Rune Factory 2 is multigenerational. Players begin the game as Kyle, a strange man who comes to Alvarna Village. Eventually, players will take on the role of Kyle's child, opening up a whole new adventure. It's an innovative feature that allows players to follow the story of their family and the townsfolk over two generations! Rune Factory 2 is rated E for Everyone by the Entertainment Software Rating Board (ESRB). To order Rune Factory 2: A Fantasy Harvest Moon and receive the limited addition squirrel plush, please visit For more information on Natsume's titles, please visit www.natsume.com.